Italian tenor Andrea Bocelli is one of the greatest musical talents in the world today. He consistently delights audiences with his powerful voice and seamless range whether singing opera or popular music. Blind since the age of 12, Bocelli, who also plays piano, flute and saxophone, has developed an unprecedented mastery of his voice. He began singing in his thirties, playing piano bars in Italy, and got his big break when Luciano Pavarotti heard a demo tape. The two recorded a duet which became a major hit. 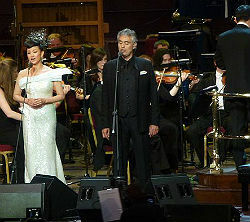 Bocelli has since recorded with Celine Dion, Sarah Brightman and also performed for the Pope. Fans who attend his concerts around the globe often describe his voice as that “of an angel.” Secure your choice of tickets at My Box Office Tickets and see this extraordinary talent. Tickets to Andrea Bocelli are available for the following venues, dates and times. To sort the list, click on the column header. To find tickets for the given venue, date and time, click the tickets link in that row.